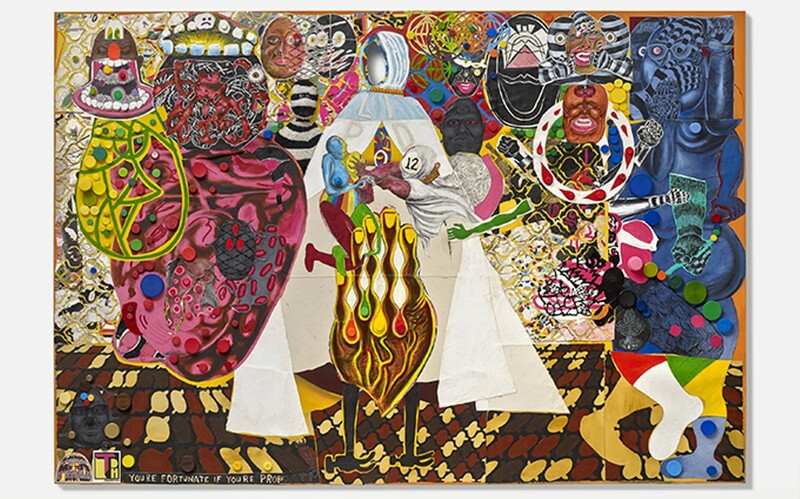 Trenton Doyle Hancock, Coloration Coronation, 2016. Acrylic and mixed media on canvas, 90 x 132 inches. © Trenton Doyle Hancock. Courtesy the artist and James Cohan, New York. Drawing inspiration from the morality tales of cartoons (a cat is always bad, but birds or mice are good; dogs also are heroes), comic books (equally flamboyant bad guys and good guys), video games and films, Trenton Doyle Hancock created his own private universe, one in which the Mounds (half-plant, half-animal, all-good living forest) and the Vegans (they eat Mounds!) endlessly battle it out for supremacy. Both Coonbear and Bringback, a henchman in a striped unitard, are part of the battle, because they're also some part of Hancock. Politics, race, class, identity and issues of social justice are hidden in these stories, just like Sun Ra's own fully scored space operas in the jazz world. Trenton Doyle Hancock: The Re-Evolving Door to the Moundverse is a collection of these drawings, sculptures and prints that show part of the eternal struggle of good and evil, right and wrong, moral and immoral. The Re-Evolving Door to the Moundverse opens with a free reception at 7 p.m. Friday, January 19, at Contemporary Art Museum St. Louis (3750 Washington Boulevard; www.camstl.org). Hancock will discuss the Moundverse and his work at 11 a.m. Saturday, January 20. The show continues through April 22, and the gallery is open 10 a.m. to 5 p.m. Wednesday through Sunday, and 10 a.m. to 8 p.m. Friday and Saturday. Admission is free.